Getting regular physical activity can lead to better grades, improved physical and mental health, more restful sleep, and now, a chance to win some seriously great prizes. 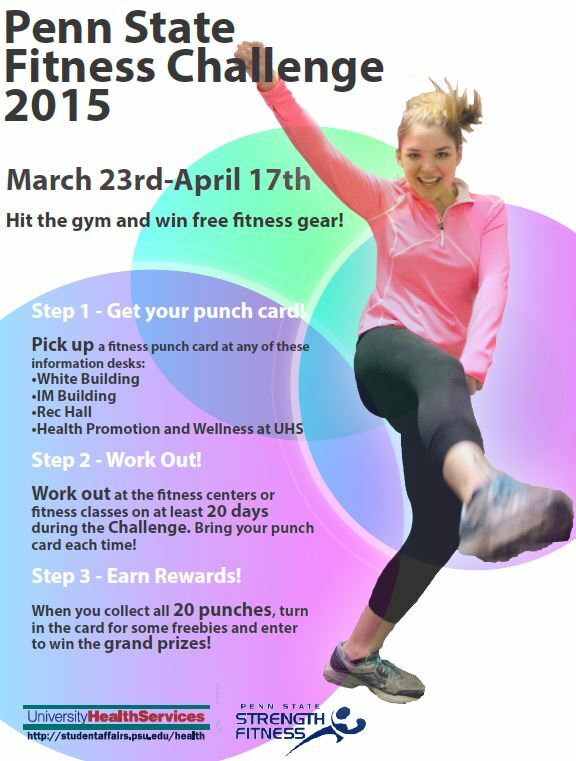 Pick up a free punch card today while supplies last at White Building, Rec Hall, or IM Building fitness info desks. Between Monday, March 23rd and Friday, April 17th, work out at least 20 times at White Building, Rec Hall, or IM Building fitness centers or classes. Be sure to present your punch card to receive a punch (limit 1 punch/day). If you’ve earned at least 20 punches on your card by April 17th, return your card to the White Building, Rec Hall or IM information desks to be entered to win prizes. Be sure to follow us on Facebook and Twitter for updates. The Challenge is co-sponsored by University Health Services and Campus Recreation.